More traffic saving for www site. No more glary in night mode. Previously the UC Browser 7.6 came out with many good features which were very useful for people who browse more. The fast and lite browser has cool features like Powerful search, Stable network, Multitabs, Compression technology, Download manager, Good preloaded time, Privacy, Bookmarks & history, URL completion, View mode, Save and share and file manager. There options were very much useful for Symbian phones now a days. 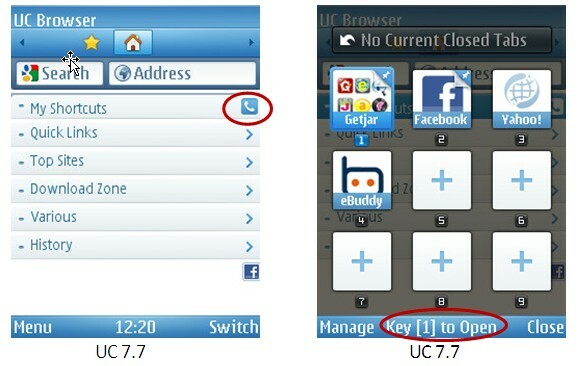 Since every one turned there mind on Android, UC Web showed enough guts to release these browser. Now talking about the latest UC Browser 7.7 i have found it very useful for any Symbian phone you have. The browser supports almost each and every model of phone available in market.It supports over 5000 mobile phones models. Check your phone model here : Click Here and coming to the above 6 features. 1) More Traffic Saving Feature : Here the browser will optimize the compression algorithm and compress the content in server side. By this we can save our bandwidth and it wont allow duplicate and similar data to transmit again.You can save around 30% of the traffic when compared to previous browser versions. 2) Better page rendering : It supports more WAP 2.0 tags. 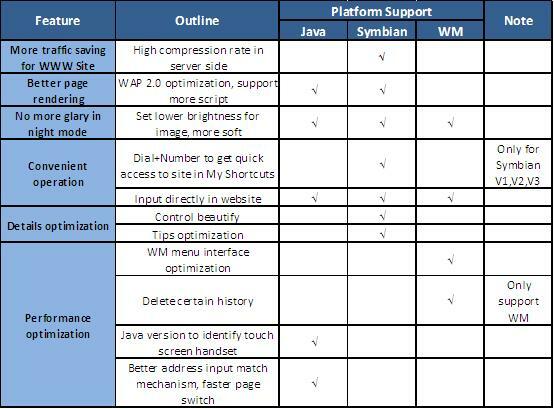 The browser will upgrade the compatibility to WAP 2.0 page by itself. The pages will appear more faster and with out lag. 4) Convenient operation : There are some cool features which make the browser very easy and convenient to operate. Like My shortcuts, Quick Links, Top Sites, Download Zone,Various, History and Also the dial + number option can get quick access to the corresponding sites in my shortcuts n Symbian V1/V2/V3. You can press the dial + 2 to open facebook as shown in below picture. 5) Details Optimization : You can enter the input directly in the browser. The improved UC optimized java version in 7.7 brings this awesome direct input feature. You can enter the query in the search directly instead of going to the notepad and enter as we used to have in previous version. Check out the picture below where you can enter the query directly in the search bar instead of the back end notepad. 6) Performance optimization : There are a lot of changes in the interface to get a good preform ace, like the change of Tips, Search, background color and fonts are optimized wonderfully. The browser is being released in many languages now, I think Indian users will get there first ever fastest browser in Hindi. These are the some of the highlights of UC Wen browser 7,7 and now what are you waiting for ? Go get you UC Browser 7.7 now. This is it, Just take a look at the browser and have fun. Please leave a comment below on your experience. You can visit there official site and forum for more info. opera MINI is the best of all browsers for both mobile phones and Smartphones. Thanks for sharing this buddy ! I am using ucbrowser especially when reading in nights. The night mode is an unique feature. But only version 7.2 is available in the market. Let me try this one. I luv this browser. Bcse,it is a really very good good browser.